They had a brief split earlier this month after he shared a 'humiliating' video of her snoring which later led to him cruelly fat-shaming her in a row. 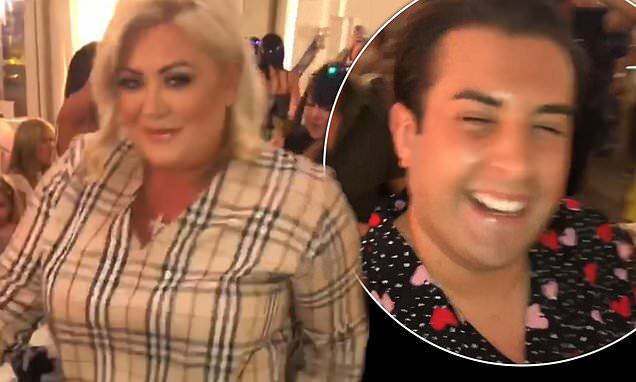 But Gemma Collins and James Argent put their troubles behind them as they continued their Tenerife getaway with on Friday with a very boozy night out. The Dancing On Ice star, 38, danced the night away at a nightclub while Arg, 31, serenaded her with a host of songs including Frank Sinatra's I Love You Baby. And for the night out Gemma looked the part as she donned a Daniella Westbrook-inspired Burberry dress. The knee-length number was perfect for the reality star to dance the night away while her beau performed a host of songs for guests. Not one to forgo the glamour, the GC opted for lashings of heavy eye makeup to compliment her glowing skin while her hair was styled in loose curls.